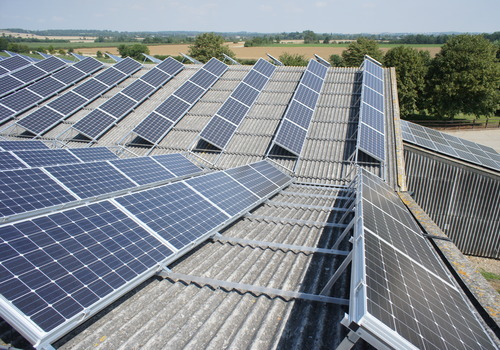 UK Solar Provider Ltd is delighted to announce it has completed a 95 kWp system in south Cambridgeshire at Vine farm last week. Our first major project here in the UK got off to a slightly rocky start in that planning permission delayed the start of the project by two months. Going into full planning became a necessity in order to allow the tilting of the panels on the east/west facing roof so that it faces the south (in order to capture maximum sunlight for the system to be as efficient as possible). With components of the highest quality from Aleo (a company owned by Bosch) and SMA, the system is mounted on 3 grain stores with the installation comprising of 416 Aleo 230W panels, 4 SMA 15000 inverters and 2 SMA 17000 TL inverters. The system itself will generate clean and green energy, of which 40% will be exported to the grid and 60% will be used on site for grain drying, saving the owners of the farm much money through reduced energy bills and income from the feed-in-tariff. With an impressive performance ratio of 80.7%, the system will produce around 91,532 kWh per year, saving 81 tonnes of CO2 emission. The SMA webbox will monitor the performance and reliability of the system 24/7, ensuring maximum functionality at all times.